This new fully furnished traditional Spanish hacienda style home has charming decor, rustic custom furniture. The dining table seats 12! There is a large bar, that seats 4. Enjoy central air and heat throughout. There is Sirius satellite radio, an I pod station. A telescope to look at the stars, a full size Golden Tee video arcade game, are just a few of the treasures inside. The front patio looks out to the beautiful Sea of Cortez, and the back patio boasts mountain, and desert views, beautiful sunsets are guaranteed! Enjoy ocean views from all the main living areas. Large spacious rooms, and soaring ceilings are sure to impress. Outside you will find endless activities. Long walks on the beach, collecting shells and sand dollars, clamming, or just sunbathing. The water provides some of the best Baja fishing, onshore and by boat. Jet skis and boats can be launched right in front of the house. The desert awaits with off road entertainment. 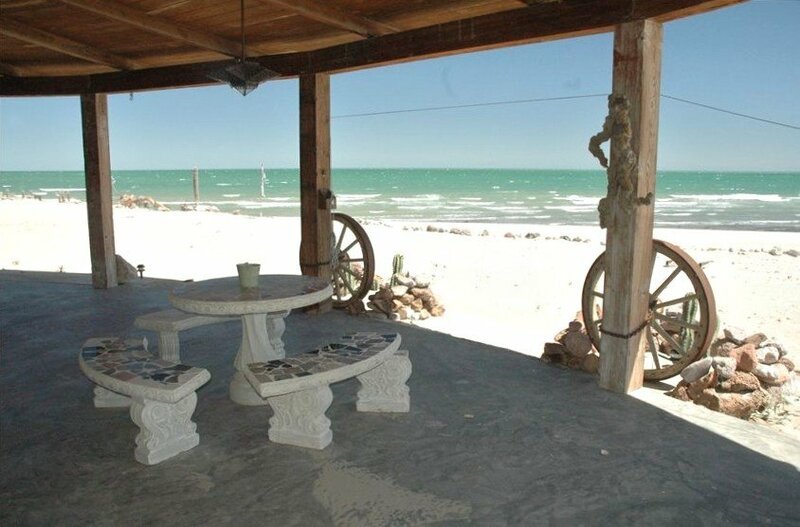 You can rent Quads and motorcycles in San Felipe or bring your own. Queen size Beds (1) each bedroom has a queen size bed, additional sleeping areas have 2 extra queen high density foam mats,and 1 rollaway twin bed and 2 twin sleeping mats., Twin or Single Beds (1) rollaway twin bed, 2 high density foam sleeping mats., Baby Cribs (1) Upon request. Oceanfront , walks on beach, soft white sand, peaceful lazy days, beautiful sunrise and sunsets, desert views, and privacy own over 1 acre oceanfront!